This is a view of Coolidge Dam of the Gila River, behind which lies San Carlos Lake. 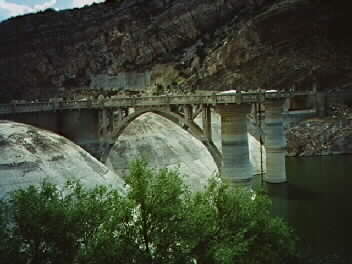 Coolidge Dam was completed in 1930 to provide controlled water downstream to the Pima Indians and white farmers who live near Florence and Coolidge, Arizona. It was also intended to assist the San Carlos Apache people, which function it does well. Unfortunately, when the dam was built the backed up waters covered the original site of San Carlos, and therefore the community was moved upstream on the San Carlos River. Will Rogers quipped on viewing the lake at its dedication, "If this were my lake I'd mow it!" because it was so low that grass grew all around. Even today the lake occasionally suffers dry spells, and even the original site of San Carlos is uncovered. Things are so dry right now (Summer 1997) that it is expected to completely dry up--a real tragedy, but not entirely unprecedented in its history.